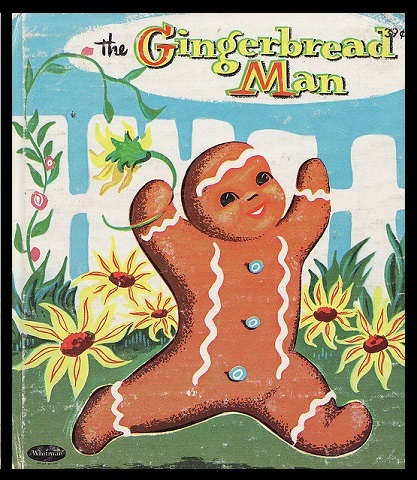 I was researching (for another post I’ll get to later) the children’s story about the Gingerbread Man. The Internet being a wondrous thing, I was able to find a photo of the front of the little hard-cover book I had as a child. I learned that there is an entire sub-genre of personification fables (where things come to life that shouldn’t be alive) dedicated to runaway food. It is usually baked goods, for whatever reason, although other countries and ethnicities have their versions of the same story: Russia, Kolobok (a ball of bread dough), Norway, Pannekaken; several German versions including the food-shaming Vom dicken fetten Pfannekuchen (The Big, Fat Pancake) and French, Roule Galette, in which the wayward food is a crepe, naturellement. The stories first began to appear in print in the 1860s, but existed long before that. I am not sure exactly why so many cultures seemed to be afraid their food would run away. Maybe it was a caution to children in hard times: “You must eat now, because there might not be food later.” But by the 1960’s when I read my little Whitman printed copy, the story had obviously become a cautionary tale about what might justly happen to naughty, disrespectful children who ran away from their parents. Modern versions exist, too. Even L. Frank Baum wrote one in 1906 called John Dough and the Cherub about a life-sized bread man and a little child. Yes, that sounds creepy to me, too. As with many children’s stories, there are versions for everyone. There is a Hannukah version (The Runaway Lattkes), The Runaway Tortilla (yes, he falls prey to Senor Coyote in the desert,) The Runaway Ricecake (Chinese), The Gingerbread Cowboy, (because…cowboys, I guess) and finally, in 2006, The Gingerbread Girl. Most children’s stories, fables and fairy tales seem to change with the sensibilities of the times. In the version I read, for instance, meant for kids of the 1960’s, it was graphic enough that the naughty Gingerbread Boy met his fate in one “SNAP” of the fox’s jaws, rather than being dismembered and slowly consumed alive as in the versions from the 1800s. The most modern takes on the runaway food story have a very 21st century vibe. I have not read either of these, but in The Stinky Cheese Man, part of a Caldecott Medal-winning collection of tales retold by John Scieszka and illustrated by Lane Smith, the cheese man supposedly runs from everyone to avoid being eaten, but then finds out that everyone is avoiding him because he smells bad. I feel sad for the cheese man. He can’t help how he smells. To be eaten, or shunned for your pungent body odor? That’s tragic. Last, there is from 2005, Peter Armour’s Stop That Pickle! where I can only assume the selfish pickle books it, leaving the rest of the deli foods to perish. I mean, who is going to run after a pickle when the sandwich and chips are right there? Sometimes the deli forgets my pickle and I don’t even care. 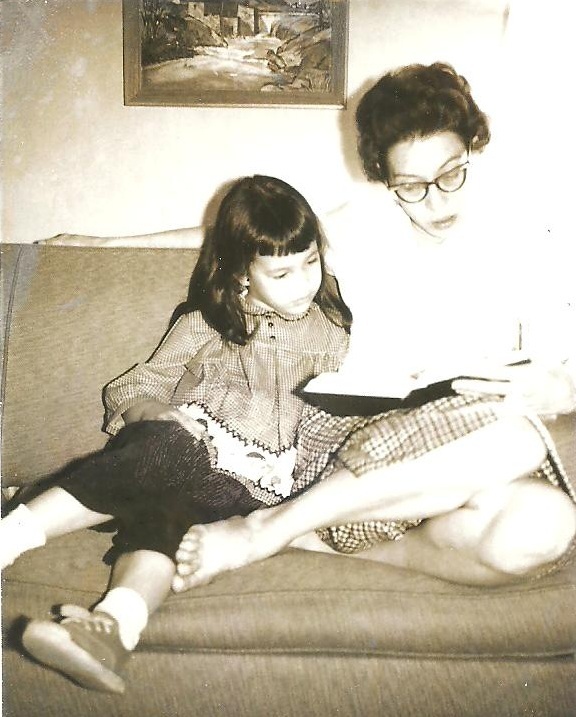 My mom, reading to me in 1963. She taught me to love books. Previous Post I can’t BRAIN today. This looks so cute! You wrote an incredible post by the way and I love your blog! Thank you so much! I saw that you read and reviewed Reconstructing Amelia. That is a book I’ve had for a while and have been meaning to read. You inspired me to make it next on my list!